Queen angelfish (Holacanthus ciliaris) are reef fish with markedly regal and dignified appearances, thanks to the crownlike bluish-black patches that exist on the upper portions of their heads. These meek yet often tough fish are native to the Atlantic Ocean. These tropical fish are visually memorable creatures with their mixture of vivid blues, bluish-greens and yellows. They also frequently display orange and lavender elements. They have noticeably tiny mouths. Their lithe bodies are usually around 18 inches long, and they usually weigh a little over 3.5 pounds. For the most part, female queen angelfish are smaller than the males. Queen angelfish tend to be solitary, but they occasionally spend time in duos, as well. They are capable of reproducing with Bermuda blue angelfish (Holacanthus bermudensis), their near kin. The resulting offspring are called Townsend's angelfish. Male queen angelfish display highly territory-oriented behavioral patterns, as do the juveniles. As far as successful feeding in captive locales go, food diversity is key. These omnivores enthusiastically consume plants and meats alike, with favorites of mysis shrimp, brine shrimp and diced seafood such as squid, clams and krill. They'll eat these whether frozen, live or fresh. Frozen herbivore blends are also beneficial. Other suitable components for rounding out their diets are marine algae, dried flakes and cut-up vegetables such as romaine lettuce, chard and zucchini. Speak to an aquatic veterinarian when planning your pet's diet, and always seek approval prior to introducing new sustenance. 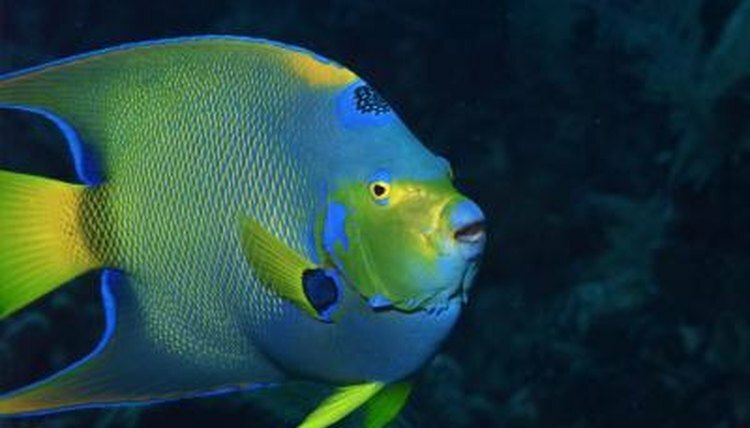 Queen angelfish in their natural habitats feed heavily on sponges. They also eat a lot of algae, hydroids, plankton, sea fans, bryozoans, anemones, soft corals, jellyfish and tunicates. The youngsters often eat skin parasites that they extract from bigger fish. The juveniles of the species also take in a lot of algae. Individuals of the species do their fair share of feeding on other inhabitants of the ocean, and they are at the same time also vulnerable to some predators of their own -- namely big fish in coral reef environments.